September 19, 2002 - 5:30 p.m. 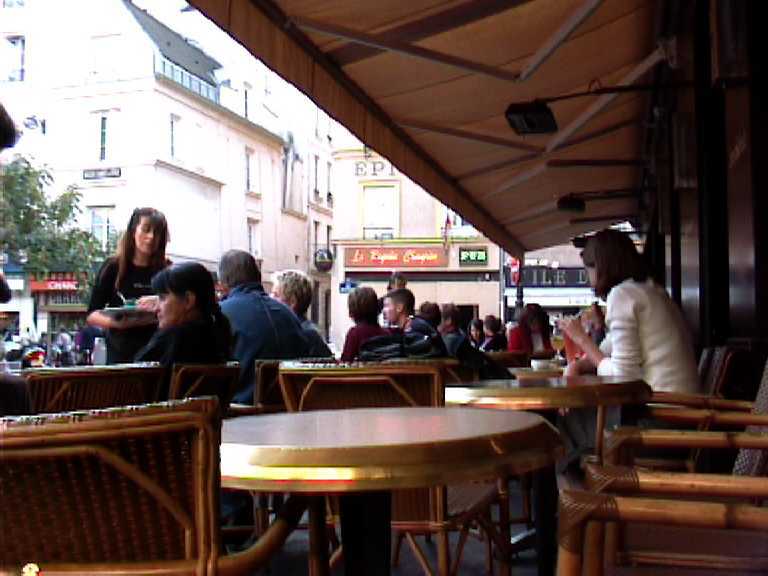 I had initially planned to go to the older café on the other side of the Place de la Contrescarpe, but there were trucks parked in front of it. Who would want to sit outside and have a truck blocking their view? Café Delmas is relatively new -- there was a completely different café here about two years ago -- but they have managed to secure a place where people can sit and actually enjoy the trees and fountain that grace the center of the roundabout here. Though cars and motorcycles come through on a regular basis, there are periods of inactivity when there is just the square and the cafés and quiet. The mustached and goateed dark young man who served me has left, and a woman with long hair and a long-sleeved Café Delmas shirt has replaced him. For a while a woman was sitting at the table next to me -- she ordered a salad and then kicked off her shoes and started editing some typewritten pages. My tabletop is round, the color of orange clay, with a brass ring around the edge. I was given a small glass of water and a packet of three sugar cubes to go with my espresso. The chairs are wicker with milk chocolate-colored plastic caning. It's a relatively big place; outside there are two rows of tables, about fifteen tables to a row. The tables face a metal chain-protected octagonal green space in the center of the square. Inside the green space are four medium-sized trees surrounding a dormant fountain. There are restaurants and pubs all around the edges of the square, including a Häagen-Dazs ice cream shop and a seemingly-defunct Italian bistrot whose windows have been filled in with white shoe polish. 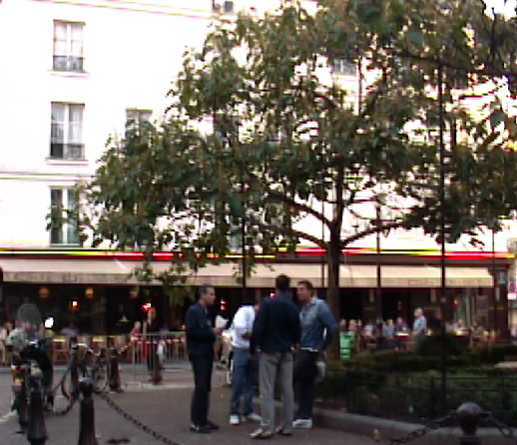 The Place de la Contrescarpe is a good spot to see soon-to-be-ex-bachelors cavorting with their friends. Several times that I've passed through here I've seen men dressed up in women's clothing or animal costumes in the Parisien tradition of making a fool out of yourself in public before you get married. I don't see any of that going on now, however. It's probably more of a weekend thing.